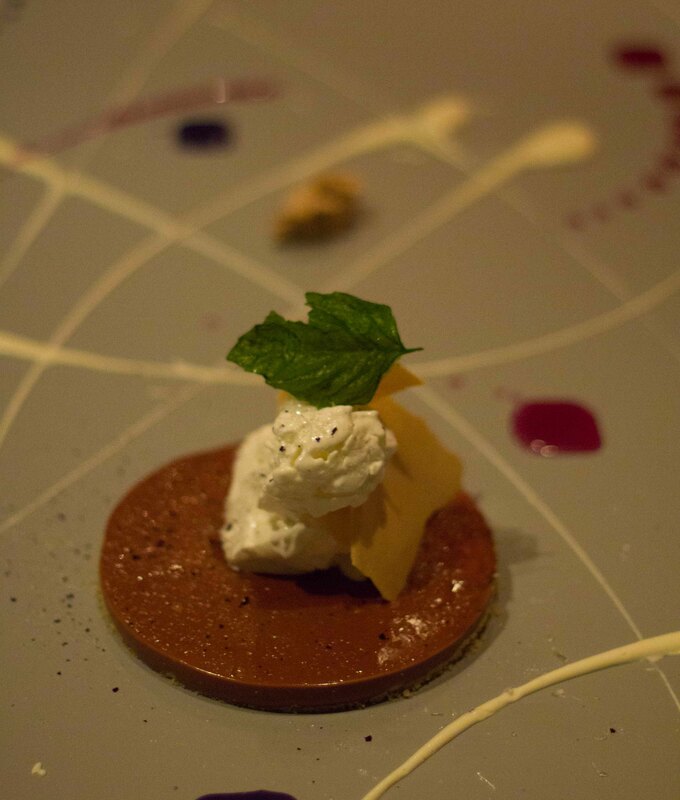 I’ve posted about my journey to Alinea, but now I was there. I was seated and it was time to start the dance. 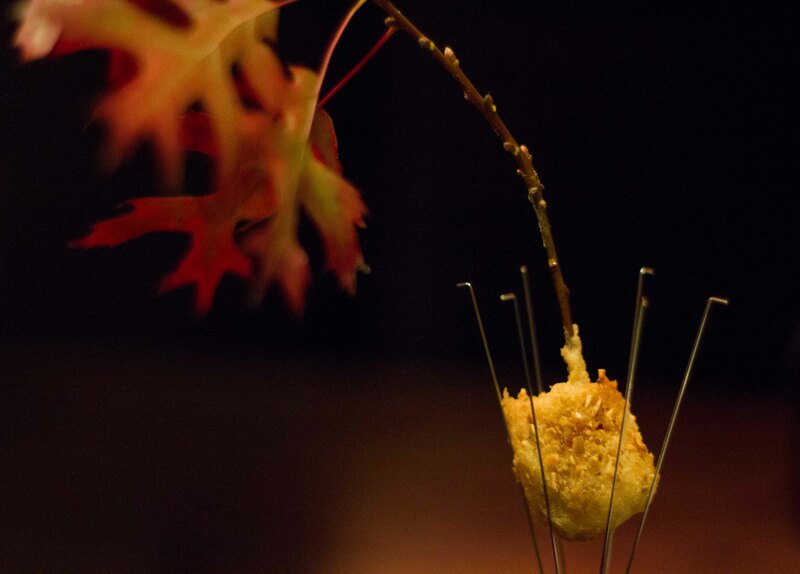 The design aspect of Alinea was thoroughly explained in Chef Grant Achatz and Nick Kokonas’ book, “Life, on the Line“. I had a great picture in my mind of what the multiple dining spaces, the tablecloth-less tables and wear resistant fabric on the seats were going to look like, but sitting in the rom, everything was much more sophisticated than I had imagined it would be. 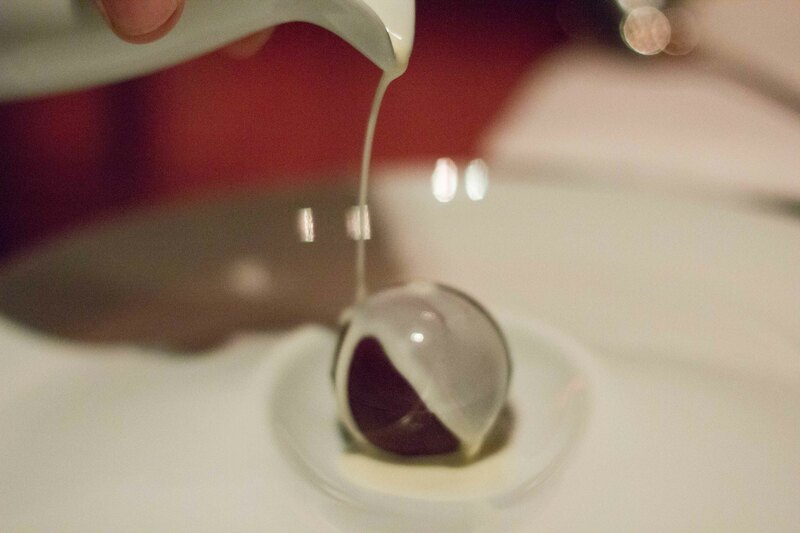 I knew that Chef Achatz’s cuisine was avant-garde, so I couldn’t help but feel the food was going to be at such a juxtaposition from the refined surroundings. 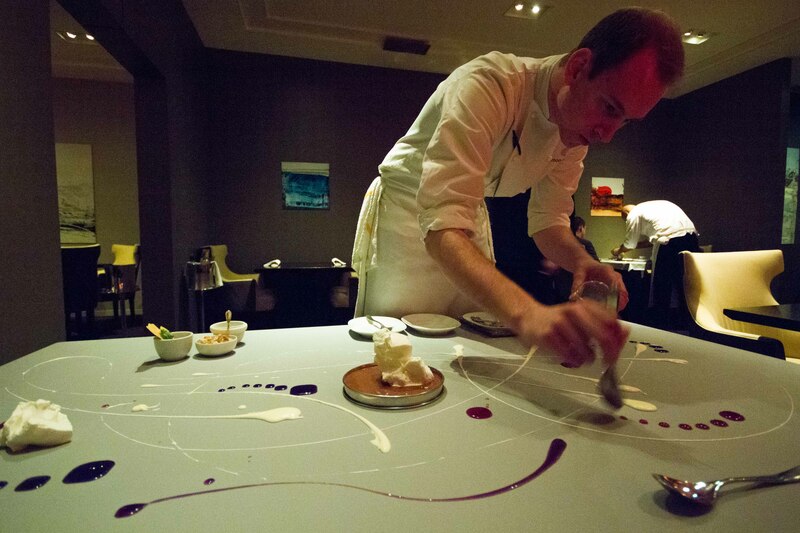 What I would come to realize though is that the dining room at Alinea was the gallery and the food that I would be served, the art. The Zegna-clad service staff were supremely professional and friendly. They responded well to my “casual” attitude and matched their service to suit my demeanour. I was also guided very well through my wine selections for the evening. 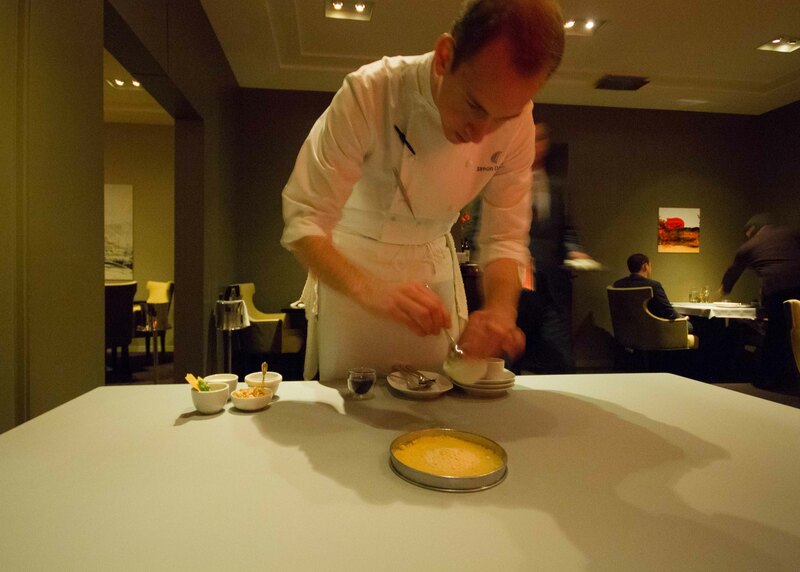 I was given the great attention one expects from a 3* Michelin experience. The serving vessels and implements seemed so complex but also mind-blowingly simple and perfectly paired for each course. There was so much potential that the artful serving pieces could have taken away from the food, or felt gimmicky, but that wasn’t the case. 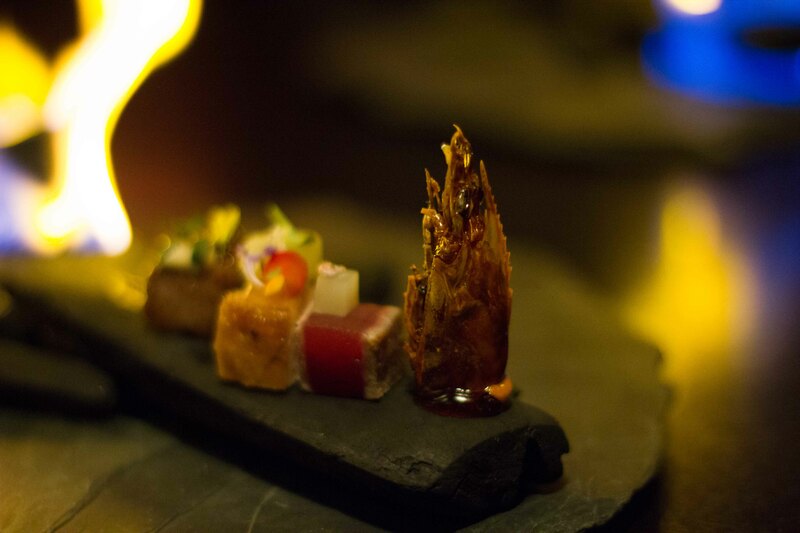 Each piece was meant to highlight or accentuate the whimsical nature of the dining experience. As always, looking back I have regrets in terms of documentation for this post. I should have taken photos of the restaurant, and I could have worked harder on getting better photos of the food. My descriptions of the actual dishes themselves will not do each justice. I have the same regret time and time again that I wish I were a note taker. But I’m unwilling to compromise my experience in the moment to do so. Instead, please enjoy the photos. Know that each dish blew my mind. Take away from my experience that if you were ever curious about dining at Alinea that you should definitely do make it a priority to do so. Burning Oak – soft pumpkin with birch. The leaves were torched before service and the combination of the aroma of burning leaves with the flavours of pumpkin pulled me right into fall. 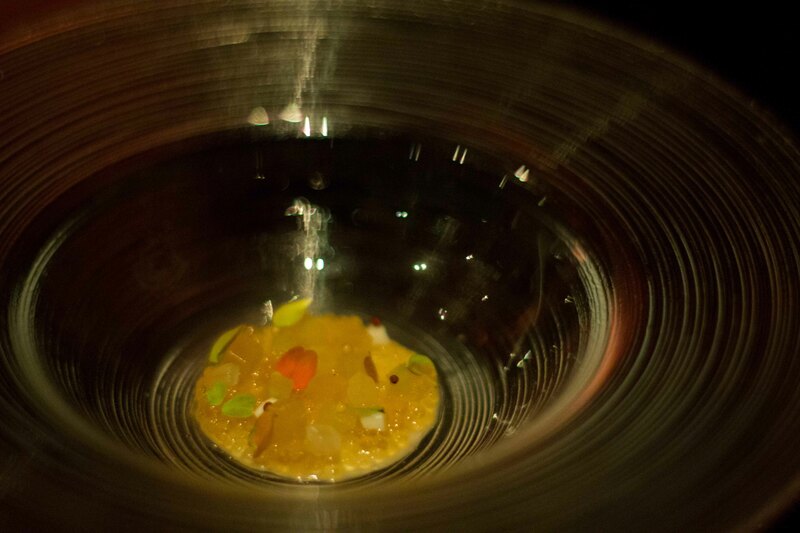 Trout roe with matsutake, apple and mustard – this dish was so much more than the description of it. 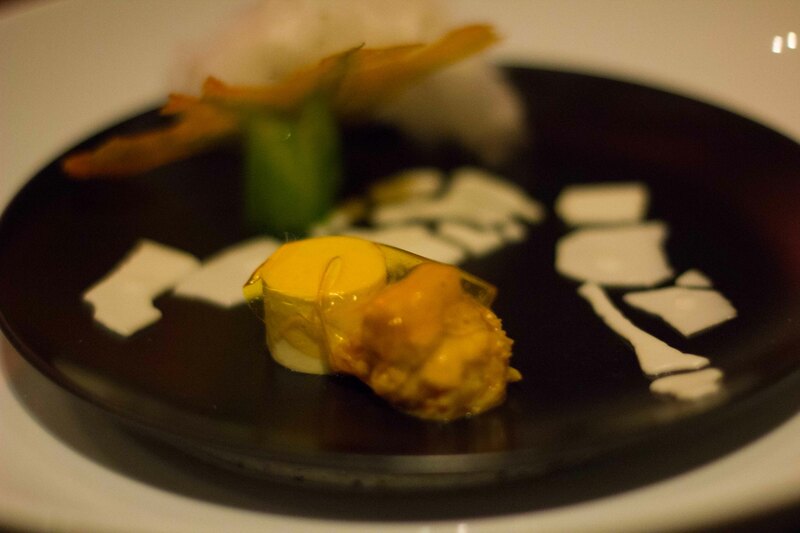 While the first dish awoke my senses, this one was about contrasting textures and flavours. 2 dishes in, and my mind was already blown. 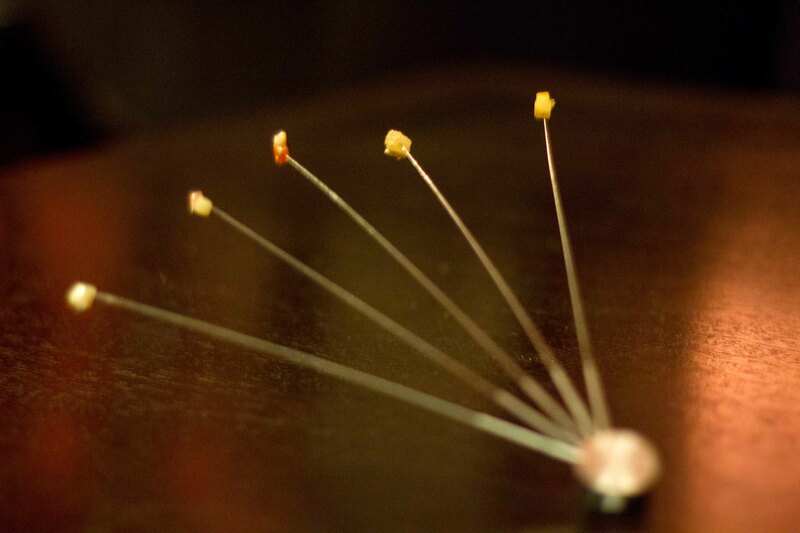 Scallop – citrus aroma, 14 textures. 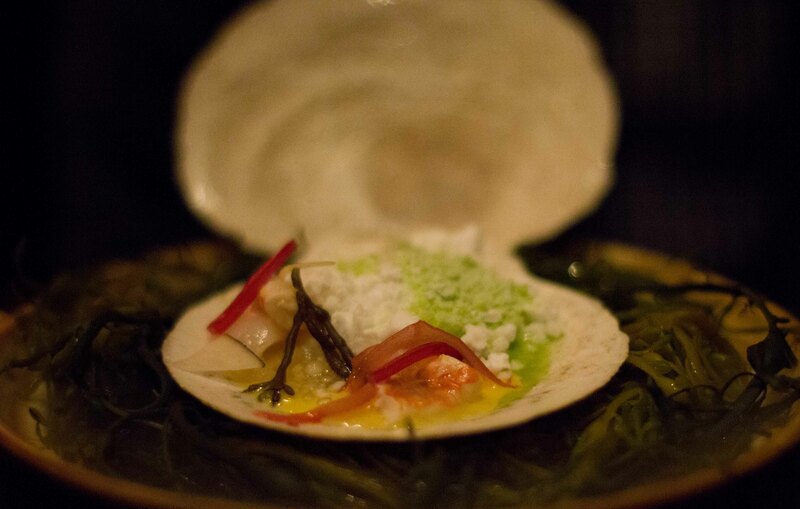 The citrus aroma was lemongrass-y “smoke” wafting underneath the seaweed. The contrasts of textures and temperatures of this dish showed a confidence of skill that I’ve never experienced before. Dungeness crab with squash blossoms, cardamom and saffron. Binchotan – Tokyo inspiration. Fire? Now they’re serving fire? I loved the little components of this plate, but the star was definitely the crunchy shrimp head. 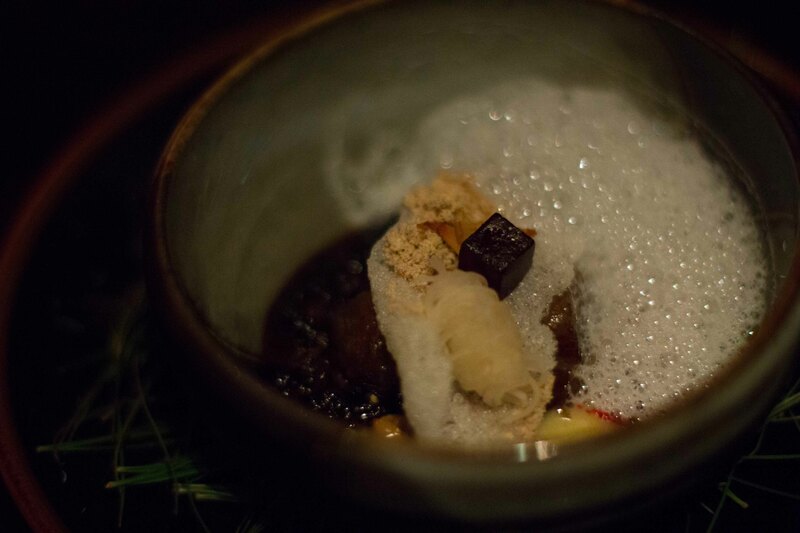 Veal Cheeks – lapsang souchong, pine, blackberry. 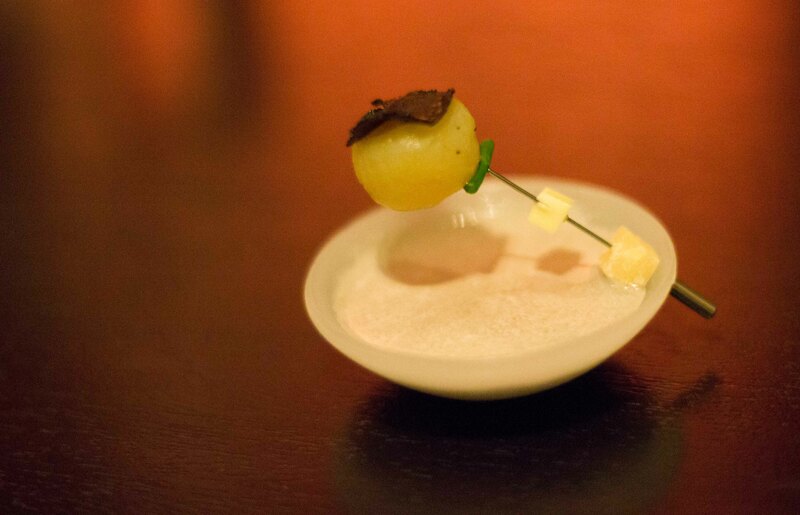 Hot potato, cold potato with black truffle and butter. My favorite dish of the night in execution, taste and presentation. Pull the pin and the hot potato falls into the cold potato soup. Brilliant. 60 choices of accompaniments! This plate was visually stunning, if not a bit overwhelming. A Do It Yourself creation. A fight with your dining companion for the “best pairings”. Creative in execution and a work of art to look at. 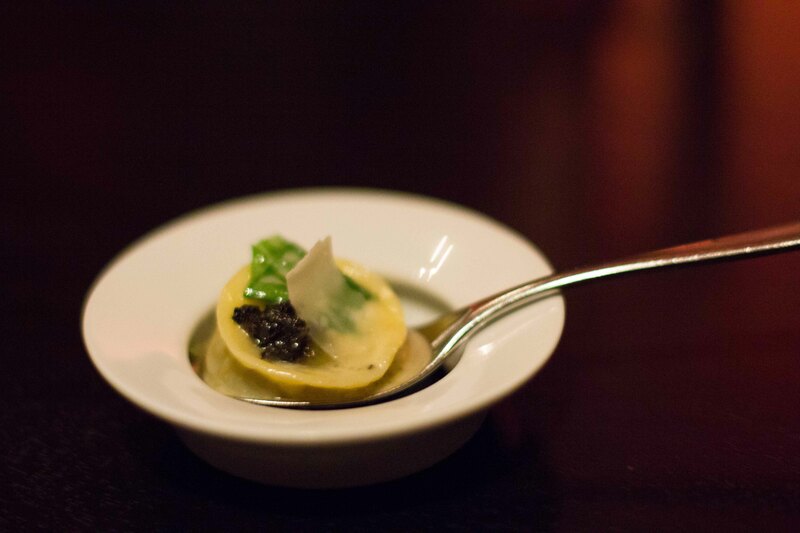 Black truffle explosion with romaine and parmesan. Did I say the potato dish was my favourite? My mistake, this was my favourite dish. Actually not a dish, because the vessel holding this piece of pasta had no bottom. There is a reason this dish continues to be included on the menu year after year. Ginger – 5 other flavours. A unique palate cleanser. 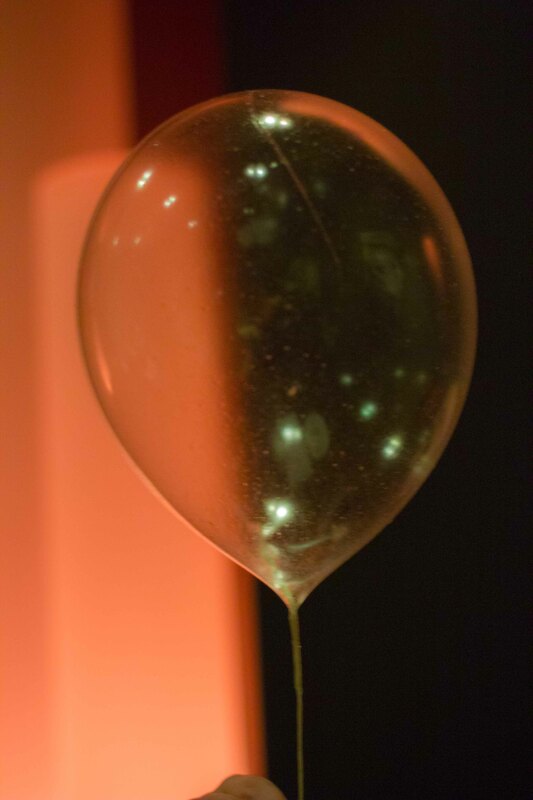 Balloon – helium and green apple. Because I’ve already had 2 favourites, I’ll declare this my favourite sweet. All of the dishes were interactive, but this one required active participation for the fun. You popped the balloon with your mouth, sucked it the helium and savoured the apple fruit leather like “balloon”. I wanted to jump up and down clapping my hands and ask for more in my high pitched helium voice. Corn – white chocolate, honey and mango. 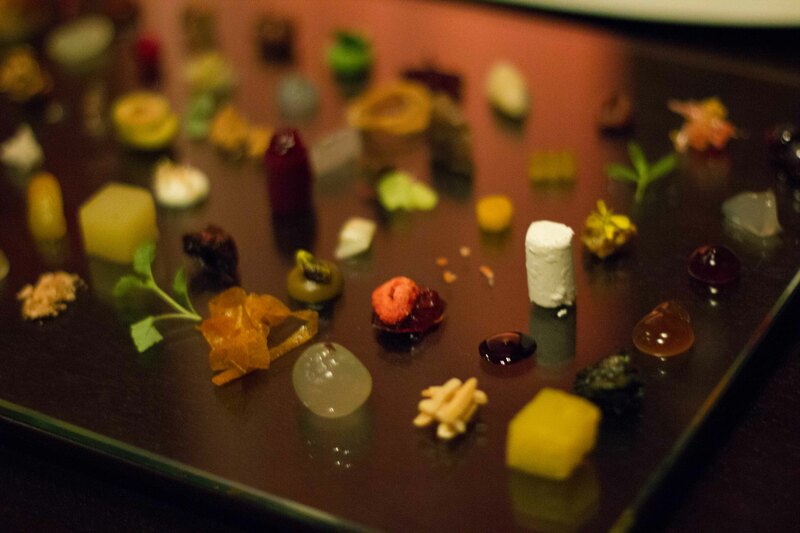 The last course at Alinea is quite extraordinary. I had known it was coming, but still couldn’t help but feel incredibly excited in its execution. To prepare for this dessert, the table is cleared and a large silicone piece of fabric is draped over the top. Ingredients are left in small bowls at the edge of the table. One of the chef’s then comes up to the table and starts their final work of art. Literally. I really wish I had more room in my stomach to enjoy this dessert, but I had hit the wall a few courses back. Dinner was over, and I was supremely happy. 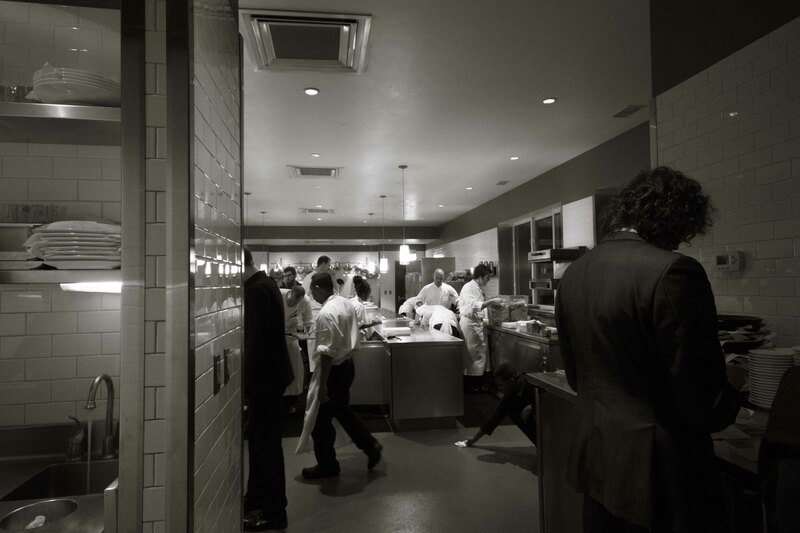 In the book, I know that if you see Chef Achatz after the meal he will ask diners “how did we do?”. That’s a question I got to respond to in-person and my response is part of my next post, “My conversation with Grant (and Nick)”. By the time my meal was finished the kitchen was in full break-down mode. Glad you enjoyed!!! thanks for the write up and photos! Thank you for reading and your comment Nick! 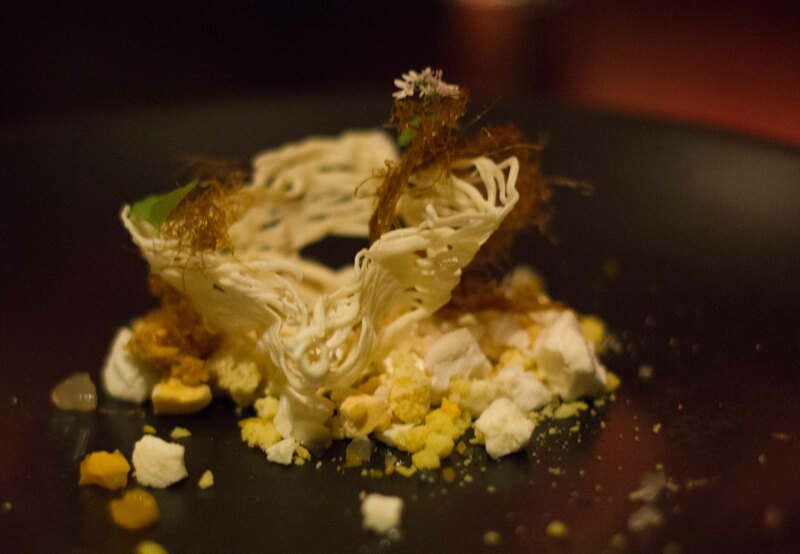 I have one more post on my “experience” to come from my night at the Aviary after the Spinning Plates premier. Was wonderful to meet you that night and have the opportunity to chat with you! What an amazing looking meal. Having read the book which described some of the dishes, the photos made it come to life. 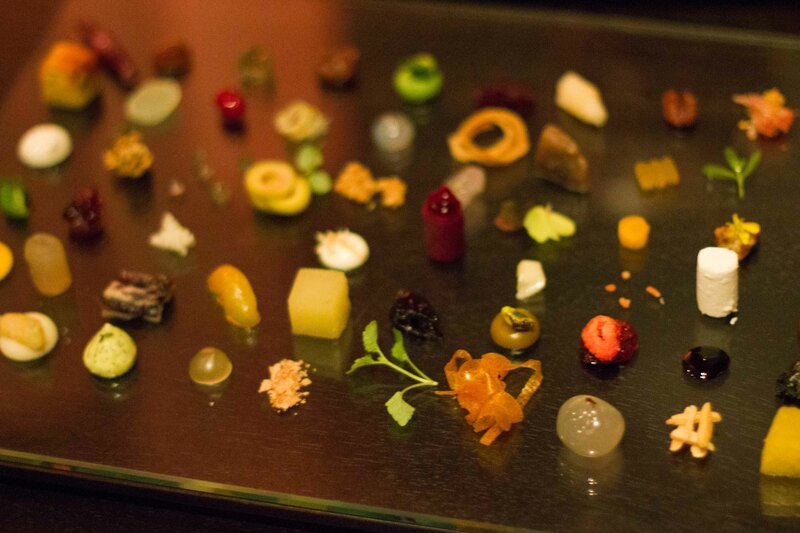 I look forward to getting to Alinea one day in the not too distant future. Thanks Tom! It was such a dining high, I think you should book sooner than later!! !